Chihuahua puppies, such awesome little dogs. The Chihuahua has been gaining in popularity due to their tiny size and loving nature. They are such funny, and extremely loyal little dogs. They make wonderful additions to your family or nice companions for yourself or a loved one. The Chihuahua is the worlds smallest dog breed with the average weight to be 5-6 pounds; there are even smaller ones available in the 3-4 pound range with the nickname of "Teacup". 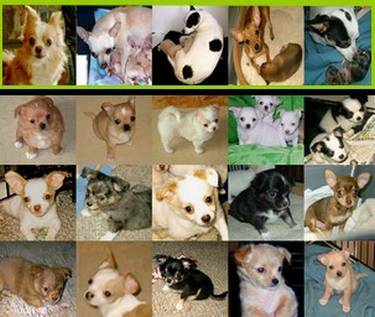 There is no official breed "Teacup Chihuahua" and I do warn about these tiny ones as they have increased health risks. There are also larger 10-12 pound Chihuahua, these can be pure bred as well just outside of the standard. I do recommend if your looking for a show dog you stay within the standards. We raise both Smooth Coat and Long Hair Chihuahua, Applehead and Deer; all-around enjoyable. We play with each new little one to begin the socialization process (my favorite part). Early socialization for the Chihuahua is extremely important. Our puppies are CKC Registered and pure Chihuahua Awesome. They are all guaranteed to come to you healthy and happy! If you would like to see pictures of how a few of our puppies matured (always fun for me), read testimonials from their permanent homes. You can call for more info or e-mail me using the contact box below. Thank you for taking the time to view our Puppies.